Per Una Stormwear red parka style jacket, size 10. Black and white striped lining. Zip and button fastening. Toggle waist adjusters. Front pockets. In very good condition. Stunning m and s Navy and gold military jacket. Zip fastening. Cotton elastane and material. This is a ladies coat made by M&S from 100% Cotton and is a high quality fabric in a good weight to ensure it always hangs well, it is plain beige in colour. It is a double breasted style with a 5 button fastening and is belted to ensure a nice fit, it has 2 pockets at the sides and has a storm collar and kick pleat at the back, it is fully lined with a high class lining. Unusual floral 91% cotton single breasted coat/jacket. 2 front pockets with button fastening. M & S Indigo khaki summer jacket, size 12, lined. Belt. Main fabric: 100% cotton. Lining: 80% polyester, 20% cotton. Sleeve lining: 100% polyester. Machine washable. Excellent condition, hardly worn. Postage to UK only, no returns. M&S khaki green cotton summer parka, well used. Size 16 . Condition is Used. Dispatched with Royal Mail 2nd Class. Ladies Denim Jacket Size 12 Blue Marks and Spencer Indigo Worn Good Condition. Condition is Used. please see my other eBay items this week , thank you for looking. By Marks and Spencer. Colour beige and black. Animal pattern casual jacket - body lined but not the sleeves. and I will try to rectify it. We all make mistakes and a chance to put things right would be great. 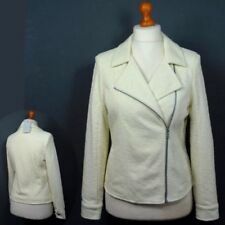 Ladies lovely white cotton jacket. By M&S Collection. Ladies Smart Lightweight Casual Jacket/Coat - Size 10 - M&S - Stone. Condition is used but good condition and comes from a smoke and pet free home. Dispatched with Royal Mail 2nd Class. ladies pretty Marks and Spencers summer jacket size 16, cream cotton. ladies pretty Marks and Spencers summer jacket size 16, cream cotton.. I have listed as used although I’ve never actually worn it. It has 3/4 sleeves and pockets and is 25 inches in length .It has a pretty thin stripe pattern on the outside and small spots on the inside. BNWT M&S Trenchcoat. Belt around middle. Marks & Spencer Peruna Womens Jacket Size 16 . Marks & Spencer Peruna Womens dark orange storm wear Jacket Size 16 zip and button front with hood,2 button front patch pockets,adjustable elasticated waist and hood, button shoulder lapels 100%cotton lining , very good condition. From a smoke and pet free home Any questions please ask Post to uk only Sorry no returns . Per Una M&S trench coat Size 16 Stylish Grey With Pink Lining 77 Cms Length. Condition is Used. Dispatched with Royal Mail 2nd Class. M&S WOMAN - Stunning Navy & White Stripe Fitted Cotton Mix Jacket - Size UK 10. 97% Cotton, 3% Elastane. Bust Measures 34”, Length Measures 22”. Features A Classic Collar, A Single Button Front Fastening, 3/4 Sleeves, 2 Front Flap Pockets, And Is Lined. Worn Only 2-3 Times, And Still In Great Condition. M&S New York Autograph Denim Jacket. Ladies denim jacket. The colour is labeled as black although I would go with more of a charcoal/grey. The images make it look pale and washed out, it is darker with a slight worn look. M&S Summer jacket size20 Bnwt In Green. Condition is New with tags. Dispatched with Royal Mail 2nd Class. M&S Per Una Belted Mac / Trench Coat. Composition - 97% Cotton, 3% Elastane. Colour - Beige. Used but in excellent condition. UK Size 12. Hip length. 100% cotton jacket from m and s indigo range. Beautiful blue lining. Can be gathered at the waist for extra cosiness but l wore it not gathered. Very forgiving sizewise and versatile due to the optional gathering. Good condition black denim jacket. BNWT M&S Coat Size 26 Cost £89 It is from M&S Curve Range Length from top of shoulder to bottom of coat is 43” Pit to pit is 29” Fastens with buttons and belt. 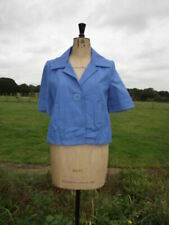 Material is 100% cotton outer and lining 100% polyester Also selling other coats and items, lots of bargains. Marks & Spencer Ladies Jacket. Really useful and stylish parka. Grey with drawstring. Zippered fishtail design at the back. Mid weight cotton. Excellent hood. Buttons up high to chin. Lots of nice design features. Marl grey jersey lining. From Indigo collection. Is a size 10 but I’m a 12/14 and it fits nicely, it is an oversized design. Marks & Spencer size 20 semi fitted Dark wash denim Blazer jacket, Front pocket 2 Button front, sleeve cuffs with 3 button design and small back vent. Ladies M&S Sleeveless Tops Size 22, 56% Cotton. M&S Khaki Brushed Cotton Military Style Jacket Size 22. Condition is Used. Dispatched with Royal Mail 2nd Class. Bought on Ebay but doesn’t suit me. Photos from original listing. Marks & Spencer ladies white cotton jacket size 10. Short, double - breasted trenchcoat/Mac type jacket. 100% Cotton with white polyester lining. Nice Matt black buttons on front and sleeves with one on back panel. Pockets to front. Bought for daughter who removed label and then decided not to keep! ladies casual jacket. Condition is used. 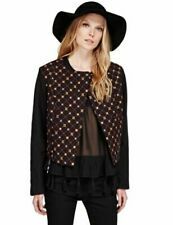 This is a ladies casual jacket by Una (M & S). UK size 10. 86% cotton with viscose/po!yester mix. Colour is mainly beige with a pink random overlay - the colours are brighter than the pictures show. 3 hook and eye fastenings, no vent. 2 patch pockets with a pink acetate lining. Delivery is by 2nd class parcel post only. Marks&Spencer 'Indigo' Cotton Jacket With Hood. Parka style, Beige colour with grey lining,2 front popper pockets, 2 zip front pockets, drawstring waist and hem. Length 38". Marks and Spencer ladies red gilet size 12. Condition is Used but excellent condition. Detachable hood. Red with black fleece lining. Label colour is stone. Pockets are still stitched. Pit to pit 20.5”. Very good worn condition. NEW MARKS AND SPENCER INDIGO COLLECTION SOFT WHITE OPEN JACKET. DELICATE EMBROIDERED FLOWERS. SCALLOPED LACE SLEEVE EDGES & HEMLINE. LOVELY SOFT WHITE LIGHTWEIGHT COVER UP JACKET. HAVING A CLEAR OUT. CENTRE BACK LENGTH APPROX. Pure Cotton Trench Coat with Stormwear™. Product Style: Mac and trench. Care and composition. Designed for a fitted silhouette. Take a look at our size guides for more information. Keep dry with our clever water repellent technology. NWT M&S Special Occasion Jacket In Coral Colour. Size 20 Wedding? Races?